Fancy taking your place in Kraków legend? If you have a strong pair of lungs and robust knees, you could do just that—for the city is seeking a bugler to play the anthemic Hejnał Mariacki. 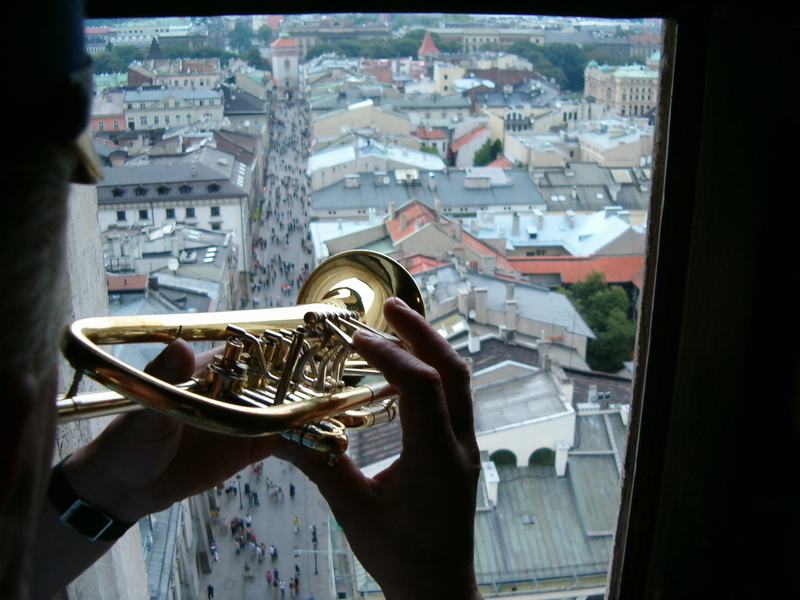 Beginning on the hour, every hour, the tune is played four times from a room at the top of the Mariacki’s highest tower. Not only is it part of the everyday fabric of Kraków life, but an abridged version of the noon bugle blast is broadcast across Poland on Polksie Radio 1. Three years ago the firefighters who play the Hejnał Mariacki received new instruments, funded by the city at a cost of 6,000 złoty each. But, while the bugles are new, two of the men (it has always been men, but women will be invited to apply for the job too this time) are coming up for retirement. The tradition of the Hejnał Mariacki supposedly began in 1241, when a watchman played from the church tower to warn the city of an advancing Tartar army. It ends abruptly because, as legend tells, he was shot through the neck with an arrow. These days, the risk of invasion from the east (Russia excepted) is minimal, although applicants for the job should remember that they climb the Mariacki steps at their peril. The tower closed to tourists because the staircase is considered unsafe, and there is virtually no fire escape. With exceptions during wartime, the Hejnał mariacki has been played from the tower ever since. Polskie Radio began their tradition of noon coverage in 1927, making it the longest running permanent radio broadcast in the world. The tune has even been turned into a souvenir, available for download as an Apple an Android app for mobile devices. Applicants for the post of keeper of legends have until the autumn to learn the Hejnał mariacki and polish their bugle skills. The recruitment process will then begin formally.